The wine has a soft, smooth entry, a rich mid-palate and the abundance of red and black berry fruit on the nose. The nose is exceptionally perfumed with an abundance of complex red and dark berry fruit, violets and intense aromas of white pepper. Dark brooding fruit follows through onto a structured, opulent palate with notes of cardamom, cumin, cloves, and black pepper. The midpalate is rich, textured and balanced with integrated acidity, cocoa powdery tannins and a definite cedarwood character derived from French oak. White pepper lingers on a smooth, lifted finish. With enough structure from our Syrah, we added a bit more Grenache than previous years. The Grenache was matured in 600L barrels to retain the unmistakable fruity aromas and vibrancy. The wine matures in 1st (all of the Cabernet Sauvignon), 2nd and 3rd filled French oak barrels for 16 months before it gets a light egg-white fining and filtration. In 1993, a group of enthusiasts purchased a farmstead near the town of Franschhoek, that had been founded in 1776. The group painstakingly replanted the vineyards and restored the property, and built a new winery. The farmstead was called Boekenhoutskloof. The winery is committed to innovation in pursuit of quality, and to this end, they have a much more modern regime than many of their neighbors. 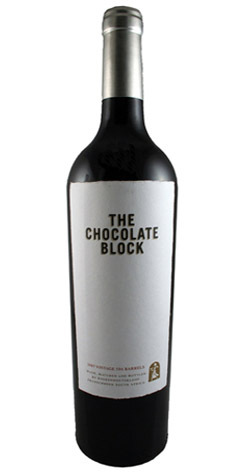 The winery has gone from one success to another, and one of the best wines has always been The Chocolate Block.